That spirit of adventure permeates Merely Players’ production of “Man of La Mancha,” playing through this weekend at Durango Arts Center. Directed by Mona Wood-Patterson, the musical interpretation of “Don Quixote,” by Miguel de Cervantes, is a bold, colorful and gutsy production. Credit Wood-Patterson and her creative on-and-off-stage teams for taking a deeply layered and complex work and bringing it vividly to life. The 1964 Broadway musical employs a narrative framing device followed by a series of nested stories. What’s at stake is the contrast between reality and fantasy, the very stuff live theater is all about. Further, “La Mancha” burrows deeply into opposing world views. Is life mean and cruel or can it be civil and kind? “La Mancha” begins in a prison run by the Spanish Inquisition roughly at the turn of the 17th century – near the end of Cervantes’ actual life in 1616. When Cervantes, poet, soldier and tax collector (the talented and engaging Jason Lythgoe) enters, angry prisoners attack him. 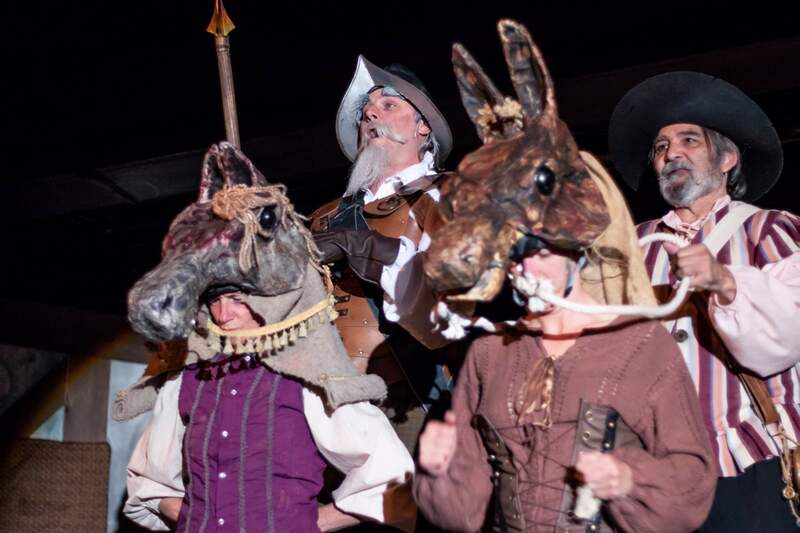 A ritualized trial ensues, but Cervantes negotiates an alternative entertainment – playacting his stories with props and costumes from his theatrical trunk and featuring his rough new group of players. The challenge for every director is to make clear which storyline is which. Cervantes’ narration is cast in words, a play-within-a-play; Don Quixote’s tales are set as a musical-within-the-prison-play. Director Wood-Patterson and company use a variety of theatrical devices to signal which is which. Set designer Charles Ford and his crew have crafted a magical stone prison with staircases, a well and a fireplace. With Monique Cuyler’s lighting design, Ford and his technical crew further clarify the braided stories with spotlights and strobes. Suzy DiSanto’s contrasting movement styles underscore the shifts, whether realistic, slow-motion or heavily stylized. Wood-Patterson’s solid casting does the rest. Lythgoe leads the way when he transforms Cervantes into Quixote onstage in one of the most magical moments in theatrical history. The actor retains the Quixote look throughout while shifting in and out of his roles plus a side excursion to Quixote’s host, Señor Alonso Quijana. With his rich baritone voice, Lythgoe masterfully uses subtle vocal and physical changes to create each character. As Aldonza, soprano Mandy Gardner is fierce, tragic and endearingly tender when she finally accepts Quixote’s vision of Dulcinea. Gardner’s immense vocal and dramatic range enable her to eventually transforms harsh reality into hope. With a servant’s pragmatism and ready humor, tenor John Garza charms everyone as Sancho Panza, He’s a perfect foil for Lythgoe’s Quixote. Jeffrey Kane Graves stands out as the Padre in several solos, both comic and serious. Geoff Johnson slithers between a vicious prisoner and the supercilious Dr. Carrasco, not to mention the spectacular Darth Vaderish demon of the mirrors. Credit the always creative JoAnn Nevils for costumes that range from prison rags to velvet capes. Count yourself lucky if you have a ticket. WHEN: 7 p.m. Friday and Saturday; 1 p.m. matinees Saturday and Sunday.